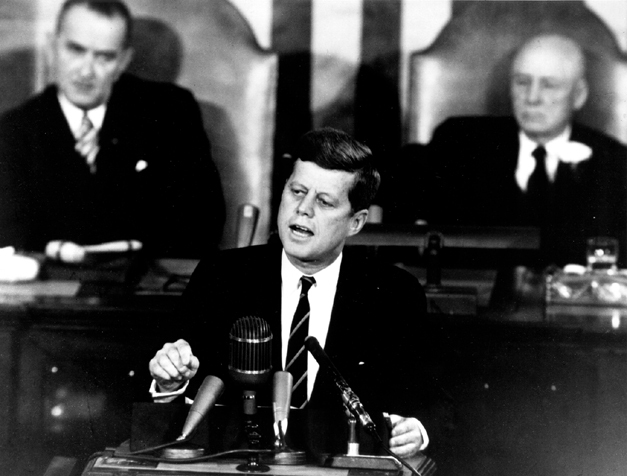 May 25, 1961 – Washington, D.C. – In a speech to a joint session of Congress, John F. Kennedy outlines his vision for American Human Spaceflight, and gives us a goal – that before this decade is out, to land a man on the Moon and return him safely to the Earth. Vision is the first and most obvious lesson from the Space Race. How powerful are the right words. With just a few words, John F. Kennedy changed the course of human events and moved an entire nation to join the journey with him. Those few words encouraged 400,000 engineers, scientists and others to labor for the better part of a decade to send just twenty-four men to orbit the moon and to have a mere twelve actually walk on it. All of that effort (and funding) came about because of one man’s vision. Many people in aerospace today are working in that industry because of the lingering hope that’s still alive in Kennedy’s words. 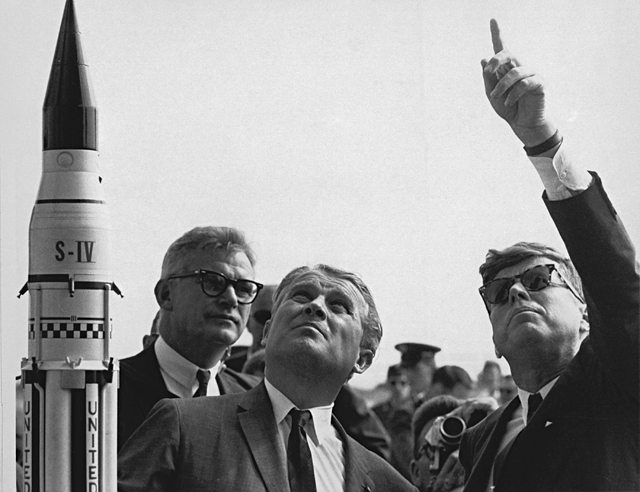 I’ve noticed that most aerospace engineers can recite the vision that Kennedy gave us – and some of those people weren’t even alive when he spoke those words! Yet that single compelling vision moved us all in a way no other force can. Vision touches us and gives us the opportunity to own the dream with the leader who casts the vision. It gives us a meaning – a connection and a purpose – that drives us towards the goal. Their vision becomes our vision. The scene probably looked like this: the manager of your department (who is probably motivated by being freshly back from some “leadership” seminar) has the idea of getting everyone together to form a common vision statement. He corrals everyone into a room with a whiteboard, and for hours you talk about developing a “vision” for your department or company. Having a vision is certainly a great idea. It’s important to have a vision for where a group of people is going, but the manager of today implements it poorly. No one in the history of developing a vision has ever successfully produced a compelling vision by having everyone stand around a white board while managers spout ridiculous tripe about how “we are the best team” or “we put customers first” or even more horrifically, some made-up slogan about how we are the best people doing the best job, and so that should motivate us. If you have ever endured this process you know exactly what I am talking about. And for some reason, the management belief is that if we include everyone and take (lots of) time to develop our vision carefully, then we will have a team who is on-board, highly motivated and ready to go! Managers are somehow immune to how ridiculous this process really is, and how in the long run it de-motivates. Many comic strips and websites are devoted to pointing out just how silly this type of thinking is. Perhaps the hearts of those managers are in the right place, and they have just got an incorrect idea about what constitutes real vision. Here is the single biggest problem with writing a vision statement that includes everyone. There is a mathematical term for taking the sum of all and dividing by the number of participants – “average.” If everyone has a say, you get average results. You never end up with a vision by going through this process. You end up with the same group of people you started with – only now they are also confused. Management recognizes the need for vision, which is good. But their methods are terrible. So what can the Space Race teach us about the first forgotten lesson? More on this topic in a subsequent post. 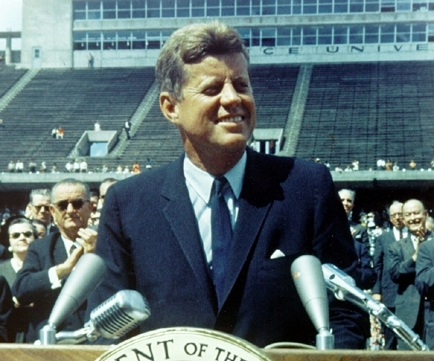 This entry was posted in Leadership lessons from the Space Race and tagged business, Kennedy Space Center, leadership, management, moon, motivation, NASA, space race. Bookmark the permalink.